This interactive presentation contains the latest gas (and a little oil) production data, from all 8,747 horizontal wells in Pennsylvania that started producing since 2010, through January. Gas production in Pennsylvania started this year at a record 18.3 Bcf/d, with a y-o-y growth of 2.5 Bcf/d (16%). In 2018 10% more wells began production compared with the year before (828 vs. 748) and, as you can find in the ‘Well quality’ tab, they peaked at a 16% higher rate (11,900 Mcf/d vs. 10,300 Mcf/d), on average. The 2 largest natural gas producers in the state, Cabot and Chesapeake, started the year both with a new production record (“Top operators”). This “Ultimate Return” overview shows the relationship between gas production rates and cumulative gas production, averaged for all horizontal wells that began production in a certain quarter. The 195 horizontal wells that came online in Q4 2018 (blue curve at the top) peaked at the highest rate ever, 13,700 Mcf/d, which was also double the peak rate of the wells that started 5 years earlier (Q4 2013). Those 372 wells have now recovered 4.6 Bcf of natural gas each and they are still flowing at 1,200 Mcf/d, on average. In the 4th tab operators are ranked by their average well productivity, as measured by the cumulative gas production in the first year on production. Cabot, which is active in a very prolific area in Susquehanna County, comes out on top, with an average result of 3.3 Bcf in the first year. If you only select 2017 (using the “first production year” selection), this result further increases to almost 5 Bcf. Later this week we plan to have a post on a new state! 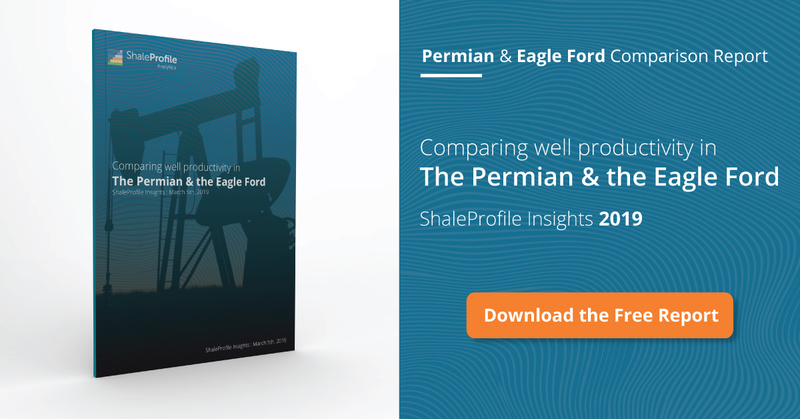 Next week, we’ll show again the latest production data for the Permian and the Eagle Ford.